This season, Wisconsin's Melvin Gordon earned second-team all-Big Ten honors after rushing for 1,466 yards and 12 touchdowns. His 8.1 yards-per-carry average ranks fifth among all FBS players. 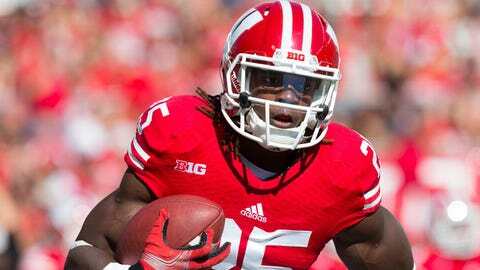 MADISON, Wis. — Melvin Gordon has goals he still wants to achieve in his college career. Among them, being a Heisman Trophy finalist and earning a degree rank pretty high. Then again, he also wants to play football at the highest level. And being an NFL standout — along with becoming a millionaire — might be on the horizon, too. Those two paths could intersect soon for Gordon, Wisconsin’s star running back, because he acknowledged Tuesday night that he had submitted paperwork with the NFL’s draft advisory board. That board, consisting of a panel of pro scouting experts, will evaluate Gordon’s film and provide a grade as to where they believe he may be selected in the upcoming draft. Gordon wouldn’t offer an exact grade that would sway him, but it’s clear he is heavily considering the prospect of leaving, depending on their feedback. "Emotions might run high when I see it," he said of the grade. "You never know. We’re going to find out." This season, Gordon earned second-team all-Big Ten honors after rushing for 1,466 yards and 12 touchdowns. His 8.1 yards-per-carry average ranks fifth among all FBS players, and his 122.2 yards rushing per game rank No. 12. Gordon, a redshirt sophomore from Kenosha, Wis., stormed out to a tremendous start to put himself into legitimate Heisman Trophy conversations. Through four games, he rushed for an average of 156.0 yards and scored seven touchdowns on the ground. Following a disappointing performance against Ohio State, he tacked on two more 100-yard rushing efforts. But he failed to gain 100 yards in four of the team’s final five games and fell completely out of the Heisman talk. "I was close this year at the beginning of the season," he said. "Couldn’t finish strong. Just some things that happened. … If I stay, I would be a contender next year." The deadline for draft-eligible underclassmen to declare for the 2014 draft is Jan. 15, which would give Gordon two weeks to decide following Wisconsin’s Jan. 1 game against South Carolina in the Capital One Bowl. Gordon said he would make a decision soon after the bowl game, much as former Badgers running back Montee Ball did following the 2012 Rose Bowl. Ball submitted his name to the draft advisory board and received a third-round grade despite being a Heisman Trophy finalist after his junior season. He opted to return to college for his senior season and eventually wound up a second-round pick of the Denver Broncos. Asked if a third-round grade would be good enough to leave, Gordon replied, "No. Not at all." Gordon said he already had talked with Ball about the decision. "I tried to get his advice because obviously he’s been through the situation," Gordon said. "He just said just do what’s best for you. If you feel like you want to stay, then stay. He just said don’t let people trick you into doing something you don’t want to do." Wisconsin coach Gary Andersen and running backs coach Thomas Hammock already have met with Gordon to discuss the decision. Andersen said he suggested Gordon should return to Wisconsin next season. "Just development," Andersen said. "There’s a lot of things. He’s a very young player. At the end of the day, he’s still a sophomore. He’s going to have an opportunity to play in the league. "He could finish his school if he moves quickly through the process right now. He could walk out of here very, very close to having his degree done. That’s a huge positive for him. But it’d be fun to be around a guy like that that has an opportunity to compete selfishly for those awards that he would have an opportunity to compete for. That’s got to be pretty meaningful for a young man. I think that’s meaningful for Melvin. "And then he’s going to come back to a heck of an offensive line and a team that’s going to be very, very good. … He’ll make the right decision." Gordon acknowledged there were at least two areas he needed to improve on: pass catching and blocking. Teammate James White caught 37 passes for 292 yards with two touchdowns out of the backfield. Gordon, meanwhile, caught one pass all season for five yards. "I want to get some type of feedback to at least let me know what I need to work on or what they need to see. I feel like I’m good in all those areas, I just haven’t had the chance to show it. I know they’re going to bring it up." Gordon certainly would have more opportunities to showcase himself next season with White gone to graduation. He would be the focal point of the running game for the first time in his Wisconsin career. He has carried the ball a total of 263 times for 2,186 yards and 16 touchdowns. As a means of comparison, Ball carried more than 300 times in each of his final two seasons. "He’s really just scratching the surface of how good of a player he can be," Hammock said of Gordon. "I see it in practice. He’s getting better. Obviously, he’s had a good season. I think he still has room to improve and room to really take off and be in my opinion the best back in the country. "To me, I think the more football he plays, the more comfortable he’ll become. I know he’s got gaudy numbers and all those things, but he hasn’t played a whole lot of football." Gordon said he would listen to his close inner circle, which includes his parents, Melvin and Carmen. His father advised him to return to school, while his mother has waffled on the subject. "Some people were getting in her ear," Gordon said. "Just agents and stuff like that. She wanted me to stay at first. I think she’s kind of shying away from that now." For the most part, Gordon said he tried to avoid analyzing mock drafts projecting where he might go as an NFL player. He spoke with teammate Jared Abbrederis, who said worrying about draft position would only frustrate him because he would be focusing on impressing scouts. Though he is not projected as a first-round draft pick in most mock drafts, he could very well go in the second or third round. Most analysts believe he would be one of the top four running backs taken, but what that means in terms of draft position remains to be seen. Equally unknown is what Gordon ultimately will decide. If he follows the path his coach believes he should take, Gordon could be the talk of college football again next season. "I don’t always tell them what they want to hear, but I am going to tell them what I feel and what I think," Andersen said. "In this case, I told you what I feel. I think it’s best for Melvin to come back. Is that best for me as a coach? You bet it is. Is that best for Wisconsin? Yeah, you bet it is. And I believe that’s best for Melvin."